To celebrate our website facelift, we are giving away MyCare information systems to 3 lucky winners! Do You See Only Chaos When You Look At Your Healthcare Paperwork? MyCare is a portable storage tool that organises healthcare paperwork, as well as recording all your healthcare needs, using user friendly medical forms and templates. MyCare provides doctors, specialists, therapists, teachers and allied healthcare professionals with effortless access to vital information and reports effortlessly. To learn more about MyCare information system, Read here. Three lucky winners will receive a downloadable MyCare information system via email link. To be eligible you must SHARE and FOLLOW the top post found on our social media pages. SHARE and FOLLOW on all three pages to increase your chance of winning! Michelle Jankovic expressed the critical need she has experienced for such an innovative portable storage tool that organises healthcare paperwork, as well as recording all your healthcare needs, using user friendly medical forms and templates. 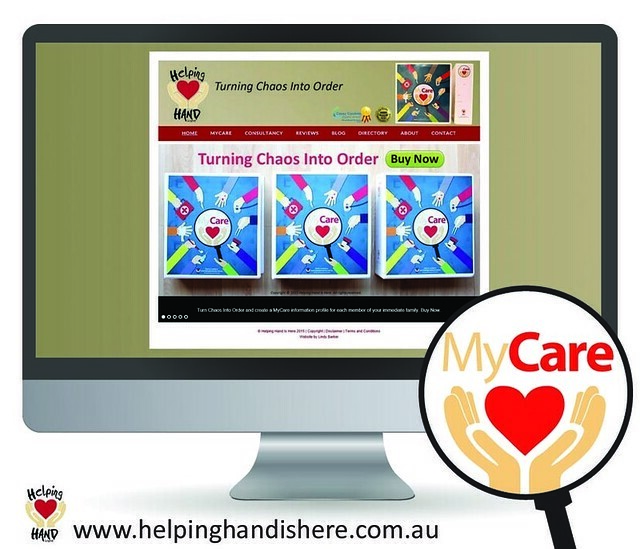 For further information about MyCare information system or individual disability consultancy, visit www.helpinghandishere.com.au. *Winners announced July 31st 2015 via social media.